In the past I have never really seen eye-to-eye with baking. It’s precision and the whole ‘needing to read all of the directions thing’ really rubbed me the wrong way. The experimentation that goes into savory cooking–adding a bit of this and a few glugs of that–has always gotten my blood pumping. I’ve tried to blame it on my ‘art’ background, but really, I think it just boils down to a lack of attention span. I would often skim baking directions and about half way through say, ‘yeah, yeah, I’ve got this’. Well it turns out that this is not an advisable approach to baking. Which is why, until recently, we haven’t gotten along. I say ‘until recently’ because there has been a relatively recent change in my life: having kids. This change has forced me to alter my outlook on baking (as well as about a million other things). Before kids, baking was cooking’s tedious, high maintenance cousin. 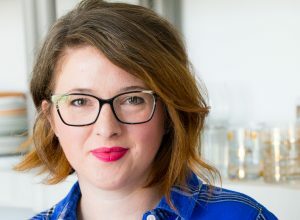 Now, baking is the answer to the question, ‘how do I have my kids help me in the kitchen?’ Baking is the way I can share and pass on my love of creating in the kitchen but also keep them away from sizzling pots, sharp knives and salmonella-y death traps. There is also the added bonus of a built in lesson: how to ‘follow directions’ – I am still mastering this myself -, how to ‘count cups and tablespoons’, and how to ‘not whip the whisk out of the bowl of dry ingredients and effectively covering everything in flour’. All good lessons. This new found respect – dare I say ‘love’ – of baking has led me down a road on which I am so grateful to be a traveler. For it is a delicious road. One that has led me to this lovely cake. 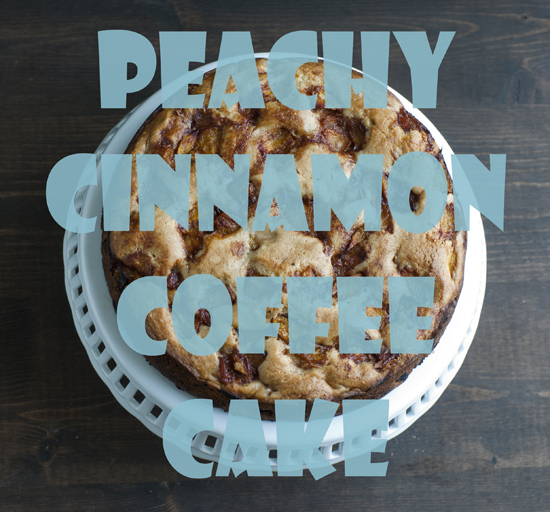 The inspiration for this Peachy Cinnamon Coffee Cake came from a recipe I found in my Grandma’s recipe box. It immediately spoke to me. I ran into a snag, however, while shopping for the ingredients. The recipe called for a boxed muffin mix that I could not locate. Anywhere. The old me would have said ‘forget this’ and swung by the bakery. But the new me relished in the challenge. I went about searching for a similar ‘from scratch’ recipe that I could make my own. 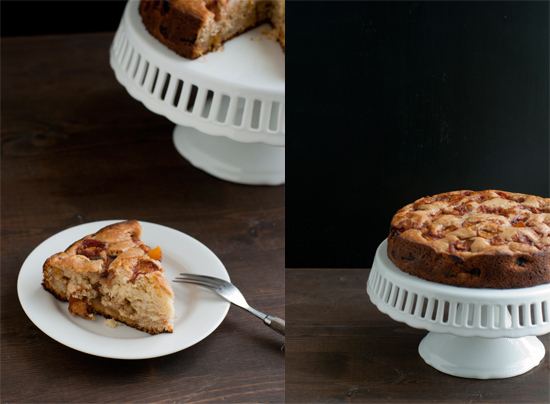 I came across an amazing looking apple cinnamon coffee cake recipe and with some swaps and tweaks, decided I could make this work. The cream cheese in the batter makes the cake incredibly moist. 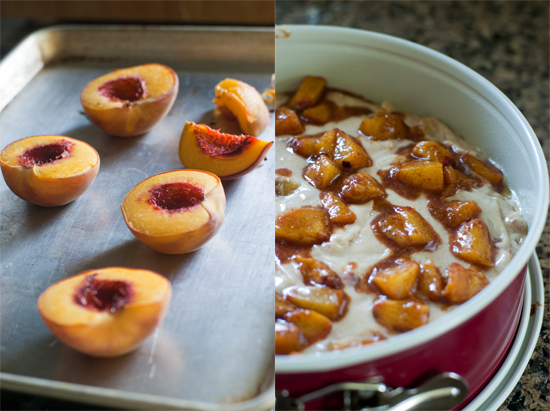 Roasting the peaches elevates the peachy flavor, taking it to the next level. A warm ‘it’s-almost-fall’ level. I love that level. As well as any cake that can be passed for breakfast food. Because, really? Cake for breakfast is awesome. Preheat oven to 400°. 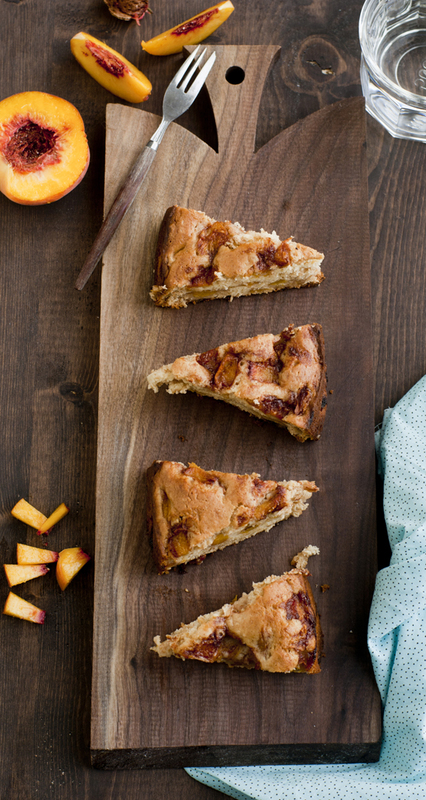 Arrange the peaches, cut side up on a rimmed baking sheet. Roast for 25 min or until they begin to soften. Allow the peaches to cool and remove skins and cop peaches. Yield about 3 cups. Adjust oven temp to 350°. Grease a 9 inch springform pan with non stick spray and set aside. In the bowl of an electric mixer, cream together 1 cup of granulated sugar, brown sugar, butter and cream cheese until creamy and light in color. This should take about 3-4 min. Add vanilla extract and beat another 30 seconds. Crack eggs into small bowl, and with the mixer on low, add one at a time to the butter mixture. Beat well after each addition. In a medium bowl, whisk together flour, baking powder and salt. Add the flour mixture to the butter mixture and mix at low speed until blended. In a small bowl, mix chopped peaches, ¼ white sugar and cinnamon. Toss to combine. Reserve ½ cup of peach mixture for the top of the cake. 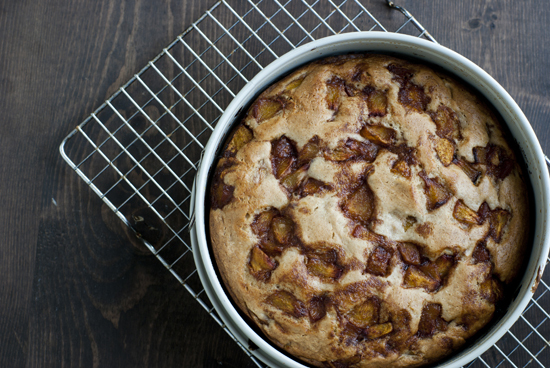 Gently fold in remaining peach mixture into the batter using a spatula. Pour batter into greased pan. Sprinkle reserved peaches on top of batter, being careful not to push peaches down into the batter. Bake for 1 hour and 15 minutes. The cake will be done when the edges begin to pull away from the pan. Allow to cool completely before removing from pan. Store extra cake covered, at room temp for 3 days.